On 19/07/2017, High Court of Hyderabad announced recruitment notification to hire candidates who completed 10th, 12th for the position of Law Clerks. High Court of Hyderabad recruitment 2017 proposes to receive the application from applicants in Online Mode. Eligible candidates can submit their application to High Court of Hyderabad before 04/08/2017. All those aspiring to apply can check out various information like eligibility criteria, salary, Total vacancy, Selection Procedure, Job description, last date, Application procedure and other key information required for the post below. Kindly go through all the below details before submitting your application Online. Interested and eligible candidates can apply before 04/08/2017. Selection Will be Based either Written Test / Personnel Interview / Other Mode by the High Court of Hyderabad norms or decision . The prescribed proforma of the application is placed in the official website of the High Court i.e. 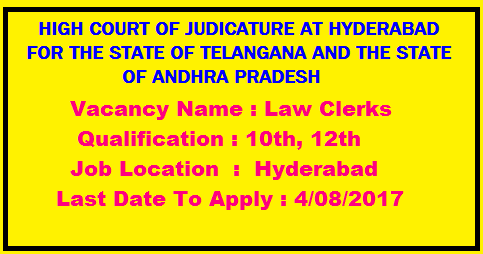 http://hc.tapnJn and the duly filled in applications shoud be sent to the Registrar General, High Court of Judicature at Hyderabad for the State of Telangana and the State of Andhra Pradesh, along with copies of relevant documents in proof of age, category and educational qualifications, in registered post with acknowledgement due, superscribed on it as “Application for the post of Law Clerks” on or before 4 – 8 – 17. Applications received after the last date will not be considered and the Registry is not responsible for the postal delay, if any.